"Mixed media miniatures, mixed media miniatures, mixed media miniatures..."
Try saying that three times real FAST! I bet you can't do it. I could barely type it three times without my fingers freezing up. Over the summer, we introduced readers to the wondrous original artworks available from our Art-O-Mat , a rehabilitated old cigarette machine that sits in The Kentucky Center's main lobby, between the box office and the bar. For $5, you pull the handle, and out pops a miniature piece of original art that you can take home, give as a gift, or set on your desk at work. There are usually about two dozen items to choose from. The photo shown above is a piece from David A. Franke's "Mind's Eye" series. Over the wood block, he layers paper, paint, ink, glass and wire mesh. Proceeds from the Art-O-Mat help to support The Kentucky Center's statewide education programs. You can find out more about the national Art-O-Mat program here. The Kentucky Center's ArtsReach program is actively supporting exposure to visual and performing arts in Louisville's California Neighborhood. On Saturday, September 19, Mike Tolbert and Istayapi Drum Group will perform and talk about Native American music and culture from 11 a.m. - 1 p.m. at the Victory Park Farmer's Market, located at 22nd and Kentucky Street. Follow this link to learn more about ArtsReach. Please share this information with any talented high school performer, visual artist, filmmaker or aspiring designer you know! 2010 audition dates have been set for The Kentucky Center Governor’s School for the Arts: March 5 & 6 (Morehead State University, Morehead); March 12 & 13 (Sacred Heart Academy/Ursuline School for the Arts, Louisville); March 19 & 20 (Transylvania University, Lexington); March 26&27 (Murray State University, Murray). Find out more by visiting GSA's website: www.kentuckygsa.org. The Kentucky Center's Arts in Healing program trains and places artists/educators in healthcare environments to provide entertaining and uplifting respites to patients, their families and friends, caregivers and staff. On Tuesday, September 15, cellist Wayne Krigger will perform at Louisville's James Graham Brown Cancer Center. On Saturday, September 19, musician Greg Acker will hold two workshops at Frazier Rehab Institute on the Jewish Hospital campus. For more information on The Kentucky Center's Arts in Healing initiative, contact Jeffrey Jamner (jjamner@kentuckycenter.org) or Martha Newman (mnewman@kentuckycenter.org). Louisville Orchestra + Dashboard Confessional, Nov. 7 = "emo explosion"
With CD titles including Drowning, The Places You Have Come to Fear and The Shade of Poison Trees, Dashboard Confessional has made a name for itself performing introspective and cathartic music also knows as "emo rock." NY's Consequence of Sound blog describes Dashboard Confessional's upcoming tour as an "emo explosion." The band will perform with the Louisville Orchestra on November 7 at The Kentucky Center, in Whitney Hall. Follow this link for ticketing information. The Kentucky Center's ArtsReach Studio program is back in session after a brief summer hiatus. The program offers free dance and violin instruction, plus mentoring, to youth on-site at community centers, churches and YMCAs throughout Kentucky. The newest ArtsReach studio location is Louisville's Newburg Community Center. This update in the Courier-Journal includes contact information for the Newburg classes. To learn more about ArtsReach, please visit The Kentucky Center's website. Louisville Ballet's "Don Quixote" to test new Whitney floor tonight! The Louisville Ballet's performance tonight of Don Quixote will be the first "test" of the new floor laid on the Whitney Hall stage at The Kentucky Center for the Performing Arts. Saturday, September 12, 2 p.m., 8 p.m.
Click here for Don Quixote ticketing information. One of the engineers who worked on developing this one-of-a-kind floor will meet tomorrow with the ballet to get their feedback regarding how it felt to perform on the new surface. In November, the Bill T. Jones/Arnie Zane Dance Company will bring their new work "Fondly Do We Hope...Fervently Do We Pray" to The Kentucky Center. Bill T. Jones, the Tony Award-winning choreographer of the wildly popular Broadway musical Spring Awakening, considers this exploration of Abraham Lincoln's life and legacy to be his greatest artistic and intellectual challenge to date. The New York Times recently ran this feature on Bill T. Enjoy! You can also check out Bill's blog and a production diary on www.fondlydowehope.com. For ticketing information on this upcoming Kentucky Center Presents performance, please follow this link. The Louisville Orchestra sold a record-breaking 5,000+ tickets during their "$9 tickets on 9/9/09" campaign. The promotion ran from 9 a.m. - 9 p.m. last night. The line at the box office was 15-20 people deep throughout the day and phones were ringing off the hook. Cars in the ticketing drive-thru lane under the Center snaked around the block. Over 45% of the total ticketing activity took place via The Kentucky Center's website, www.kentuckycenter.org. The two performances most in demand by the discount buyers were Kenny G's "Pops" concert and The Music of the Eagles: A Rock Symphony. The Louisville Orchestra was finally able to get back in the black this fiscal year. Selling thousands of $9 tickets does not represent much of a profit margin. Heather O'Mara, the Louisville Orchestra media relations manager, made this comment regarding the shocking success of the discounted ticket promotion: "It's not going to keep our lights on, but it'll help us make new friends." Click here to read the story posted on FOX41’s website. If you want to watch the FOX41 video, which for some reason is posted as two separate videos, watch this first, and then click on this for part 2. On Saturday, August 8, the ArtsReach Sisters of Sound – African Drum & Dance Rite of Passage Project held a closing celebration for family and friends of the 27 girls who completed the two week program. 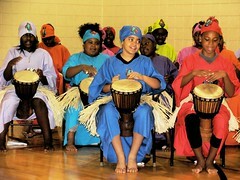 The event featured an exhibition of drumming and dance, testimonials, and an awards ceremony. In addition, each girl read a letter of appreciation to her mother and each mother presented her daughter a letter of acknowledgement. This program took place at the Chestnut Street YMCA and was funded in part by an Art Meets Activism grant from the Kentucky Foundation for Women. To see more photos from the event, please visit our Flickr page. Photo credit: Julia Youngblood. To learn more about the arts education programs of The Kentucky Center, please visit our website.